I’ve become increasingly interested in placemaking here, in observing the different local places that have become earmarked as such and wondering how they have become “places” and why some places are more successful than others. The areas I’m most interested in have often evolved into places on their own, the area creating its own vibe due to the people that live near it or visit it, to geographic features or to deliberate input and engineering. Can a place be created artificially, rather than emerging of its own volition, is a question that keeps presenting itself to me. Obviously, town planners work on creating places, or enhancing existing places. This can be surprisingly easily done at times, requiring little additional infrastructure to create a place that is inviting and attractive to people. At Bank Corner, a readily defined place in the Newcastle lexicon for many decades, a place has been created with a few simple changes. 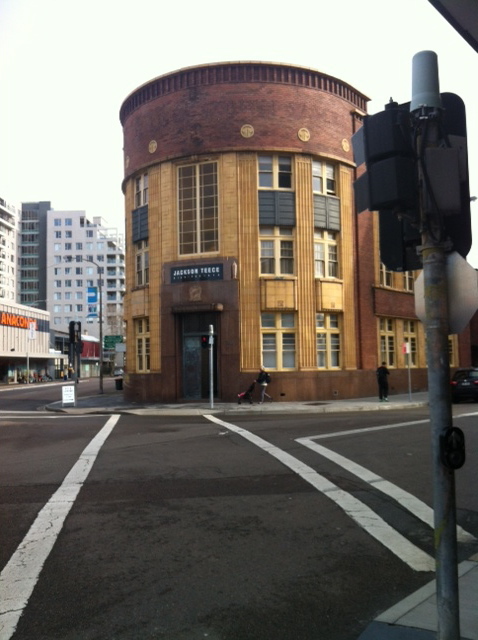 The striking Art Deco style of the corner building makes this corner stand out. A coffee shop opened there. It wanted to trade on the footpath and the footpath was widened. As part of that project, a mosaic was built into the path and some small trees were planted. 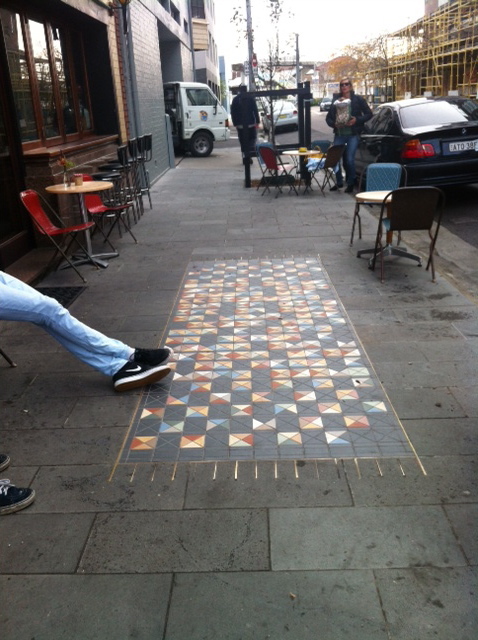 Now there is cafe seating on the footpath. 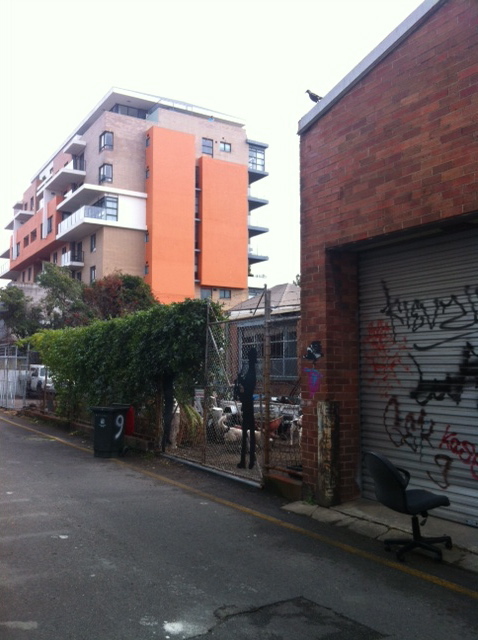 In the laneway behind it, murals have been painted, read about some of them here. 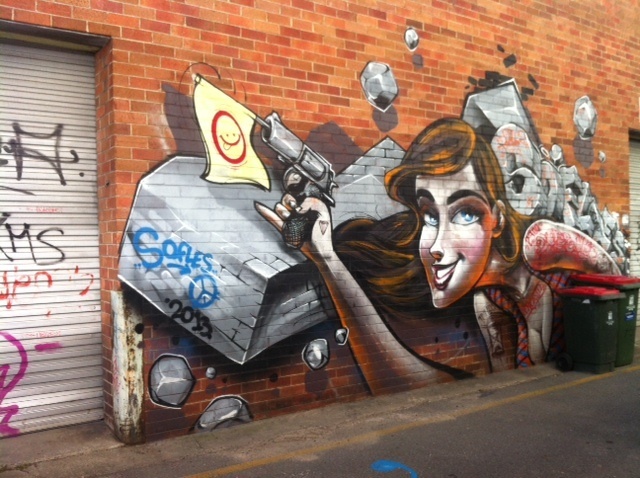 Since I wrote that former post, the “hit the bricks” festival took place and more murals have appeared in that laneway. 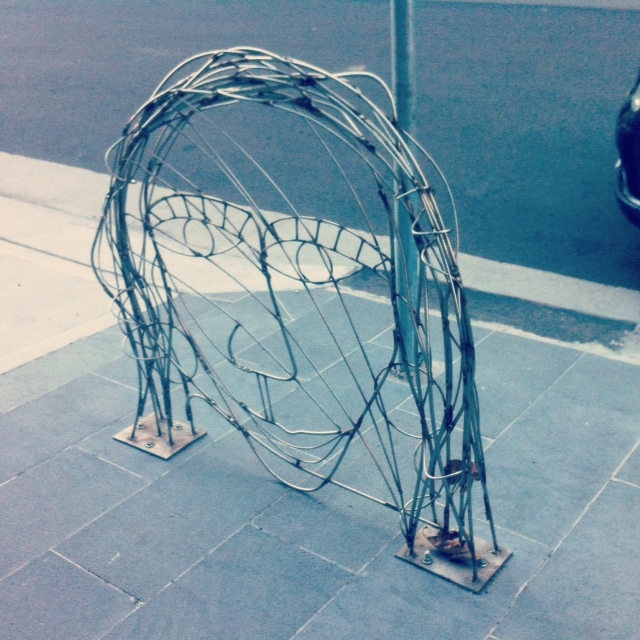 A face shaped bike rack has been added to the footpath as well. These things could have been done anywhere and not worked together to create a place, but it has worked at Bank Corner. Whether it is because of the location in Newcastle West where there is a dearth of eateries but there is a clientele for cafes, or that it is so quirky that people are attracted to it, I’m not sure. I’ll be writing a series of pieces on Newcastle placemaking, looking at places which I think work and trying to work out why each one works the way it does. 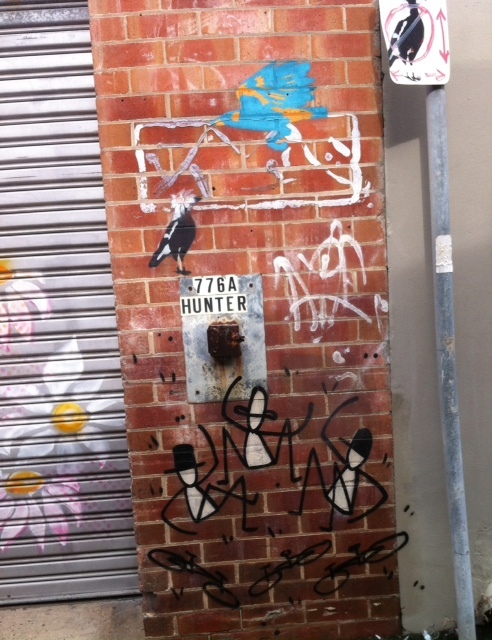 This entry was posted in Uncategorized and tagged Hunter St, newcastle, placemaking, street art. Bookmark the permalink. A pair of shoes or a bicycle is a good tool to find street treasure. Poesy is everywhere but I think we need to move slowly with the aim to get the soul of street for instance. That is one thing I like about riding: seeing the details that we miss in the car.